dejiolaluweblog: Opinion: The menace of illegal Street Trading, Signage and Advertisement campaign: A state government Uneven Crackdown. 0 Opinion: The menace of illegal Street Trading, Signage and Advertisement campaign: A state government Uneven Crackdown. Going by every economic indicators, the state of Lagos is definitely Nigeria's most prosperous and viable. Likewise generating the most revenue for the country, it equally receives the highest yearly allocation from the federation account. thanks to sustained innovative measures taken by successive governments in the state. Though population wise, it was officially edge to it by state of Kano from the last census figures. That notwithstanding, Lagos is proudly home to branches and headquarters of virtually all corporate stars from Nigeria and overseas. This no doubt positioned it as a land of immeasurable opportunity for all. So, naturally people drift in from far and near to have a feel of its riches and glory. Presently, its estimated population is put at around 20-21 million and counting. Coming from these enviable and disadvantaged position, like all mega cities around the world, it is increasingly also grappling with corollary of cumbrous infrastructural overstretch; gross social, environmental and commercial violations from its teeming populace. This is quite noticeable in form street trading by adults and especially vulnerable minors deemed unlawful by various legal provisions. Not just because they sometimes constitute social nuisance, but because precious lives of these compulsive violators are regularly put in danger. Hawkers, both young and old could be seen on its ever busy highways and ancillary routes creating scenarios for unavoidable accidents and waste management challenge. Minor girl hawkers as well are regular victims of abuses from sexual predators pretending as nicest patrons of their article of trade. Similarly, aside the approved presence of billboards and the likes; there's the issue of signage and advertisement materials considered, in spite of conceived good intentions of sponsors, to be defacing in entirety to the city's many infrastructural landmarks- roads, buildings and walls. These come in different shade and sizes which adorn frontage of MSME's, big brands and the various streets corners advertising one product or service. Dealing with illegal signage and advertisement issues, LASAA, to the best of my knowledge is very far from being effective despite its avow routine monitoring and conspicuous crackdown. In what mostly look like a controlled operation, officers of the agency on weeks unending could be seen pulling down some of these signage all in the name of crackdown while others belonging to religious organizations and sundry businesses are allow to stay. And in some cases too, several others are marked to be removed by the sponsors. A call which at best are never heeded while the agency officials do not return to enforce compliance. This gives people the impression that they're both inconsistent and selective in their operational approaches to this problem. Clearly, they're not discharging their mandate as effective as they should. In effect what you get is a situation whereby the problem is either half or not solve at all because illegal banners have continue to fester like a disease ill attended to in the state and nothing obviously is being done about it. Now to the issue of street trading, existentially complicated and vex by factors of ethnicity, danger involved and traders excesses; and which has seen persistent crackdown since the day of no nonsense governor, Babatunde Raji Fashola (SAN). Saddle with the task of eradicating the growing incident of street trading is the Kick Against Indiscipline Brigade (KAI), heavily motorized and active. But Lagos being a highly heterogenous society comprising of virtually every ethic nationalities in Nigeria, as such violators of zero tolerance to street trading like all its other legal statutes cut across all ethic groups. Until recently I must confess that I've not paid any serious attention to probability of ethnic selectiveness, deliberate or not, in the fight against the anomaly of street trading in Lagos. In recent time that I've paid detail attention to the activities of the agency legally empowered to tackle this social menace, regrettably I've noticed condemnable acts of ethnic discrimination. I realize the offenders arrested and fine are mainly other ethnic nationalities including sons and daughters of the state and Yorubas in general. 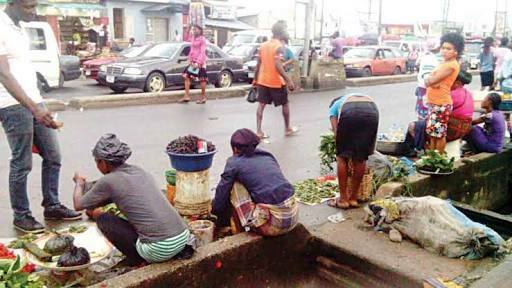 Clearly left to trade and traffic unhindered by default or some mistaken oversight are the northern elements who hawk items like kola, bitter kola, candies and yams in wheel barrow in the same socio-economic space that outlaws such. The questions begging for answers among others are are they untouchable for fear of violent backlash or some executive trade-off? Is it an act of agentry negligence? And if not, why are they not being hounded and prosecuted like others? For it nestles beyond the realm of sound political and economic wisdom to continue to harass and prevent your own from taking their rightful place and share in the economic prosperity of the state while granting unfettered access to others in an unfair and offensive ethnic dichotomy. If, finally, it's a policy which I very much doubt, it must be stopped forthwith. And if not, fine. However, deliberate efforts must not be spared to ensure a measurable even-handedness in tackling all social-politcal, cultural, religious and economic problems bedeviling the state.